Othello is one of Shakespeare's most fascinating relationship dramas. The dynamics between the characters bring out the best and worst in humanity. Love, betrayal, loyalty, and revenge, are at the forefront of the text. That may not be what was completely portrayed in The Brewing Dept. 's production of Othello. While the title may say otherwise, Othello follows Iago, a jilted lieutenant who seeks vengeance on Othello, the man who passed him over for a pronation in favor of a feeble young man. The bond of these two men is put to the test when a series of events pulls them apart as Iago plots against him by dropping deceits in his ear. 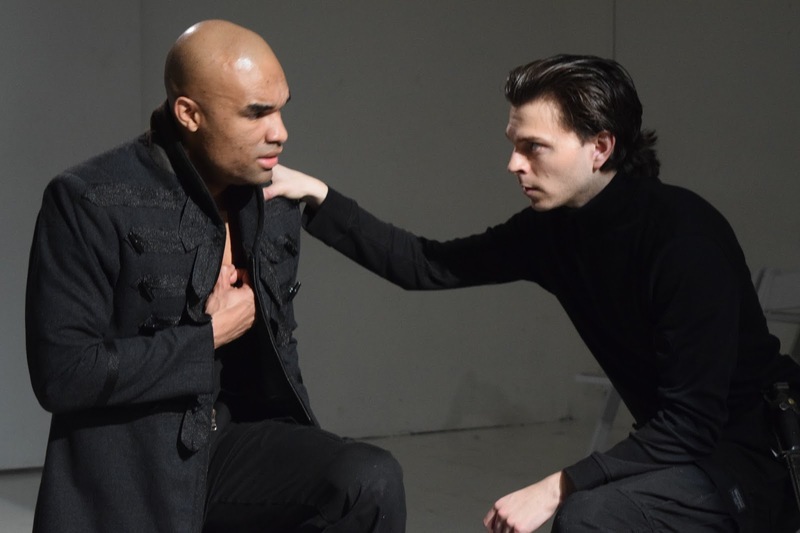 Directed by Thomas Kapusta, Kapusta's Othello is transported to a non-description time, place, and perhaps planet. If Kapusta's interpretation of Iago, who he plays in addition to directing, was a precursor to his direction, Othello was doomed from the start. In this modern age of Shakespearean revivals, productions need to stand out through concept. Kapusta implemented a, mostly, black and white visual conceit. While the set by Stephen Davan looked simple, the costumes by Ilana Breitman were so specific and intricate that you had to wonder where Kapusta's Othello was. The textures and styles made Breitman's look appear as Grecian Space. The majority of the characters were doned in black, with the exception of hipster Roderigo and Princess Leia inspired Desdemona. Desdemona’s white dress was understandable, then why exactly Roderigo was the only non-military man in white? It was a bit odd. With uniformity a key part of the overall design, any addition of color gets great attention called to it. With the costumes, aside from black and white, Breitman’s gleaming colorful belts and badges were jarring. As were the brown desk and tan stool top from Davan. They are small, subtle things, but it detracts from overall design. With the intricate simplicity as the focal design of the production, the text was the prime focus. With Kapusta playing director and a lead, juggling two hats was a bit problematic. When it came to staging, Kapusta did a fine job utilizing the space. But when it came aiding his company in character relationships and motivations, things became muddy. But that easily could be due to differing interpretations. When it came to the titular character, Ryan George exuded strength. That is until his world is turned upside down as he develops severe trust issues. George’s strength turned to hysteria. Through his hysterics, many of his lines are lost and unintelligible. George’s Othello against Jenny Vallancourt’s Desdemona was a bit strange. Vallancourt was a happily naïve Desdemona. Her innocence proved her youthfulness yet her believability against George’s Othello was minimal. In continuing odd combinations, Vallancourt also played Bianca. Sure, Bianca’s presence is minimal yet doubling her with Desdemona didn't quite work. Regardless, Vallancourt’s interpretation of Bianca was far more captivating. As the next doped causality, Jefferson Reardon’s Cassio is actually quite strong. Reardon may not be a typical Cassio but Reardon was authentic. Reardon was instantly affable and had a good grasp on the character. The other strong actor in the company was Raquel Chavez as Emilia. Chavez’s performance was exhilarating. Chavez had an immeasurable control as the handmaiden to Desdemona. Her character’s swift turn on her lover was one of the most honest moments in the entire production. Iago is the glue that holds Othello together. Iago is a master manipulator. Thomas Kapusta is anything but. Kapusta didn’t quite sell his spun truths. The key to Iago’s journey is he is referred to as honest. He is believed to be trusted. But Kapusta cowers in Othello's presence, lacking confidence. Rarely does he make eye contact when he speaks, especially to Othello. And no eye contact is detrimental to the arc and overall journey. Creating a standout production of Shakespeare is no easy feat. Sadly, The Brewing Dept. production of Othello doesn’t quite hit the mark. It was a noble attempt but in the end, it fell short. Labels: Alchemical Theatre Laboratory, Othello, Review, The Brewing Dept.